Habit is that peculiar life-force that both obscures and illuminates the crucial difference between routine and ritual. “We are spinning our own fates, good or evil,” William James wrote more than a century ago in his timeless treatise on the subject. But the greatest meditation on habit I’ve ever encountered comes not from the legendary psychologist and philosopher but from a most beloved poet: Mary Oliver, who knows a great deal about the habits of heart and mind that both help us be fully alive and make sense of loss. In the shapeliness of a life, habit plays its sovereign role… Most people take action by habit in small things more often than in important things, for it’s the simple matters that get done readily, while the more somber and interesting, taking more effort and being more complex, often must wait for another day. Thus, we could improve ourselves quite well by habit, by its judicious assistance, but it’s more likely that habits rule us. The bird in the forest or the fox on the hill has no such opportunity to forgo the important for the trivial. Habit, for these, is also the garment they wear, and indeed the very structure of their body life. It’s now or never for all their vitalities — bonding, nest building, raising a family, migrating or putting on the deeper coat of winter — all is done on time and with devoted care, even if events contain also playfulness, grace, and humor, those inseparable spirits of vitality. Neither does the tree hold back its leaves but lets them flow open or glide away when the time is right. Neither does water make its own decision about freezing or not; that moment rests with the rule of temperatures. What some might call the restrictions of the daily office they find to be an opportunity to foster the inner life. The hours are appointed and named… Life’s fretfulness is transcended. The different and the novel are sweet, but regularity and repetition are also teachers… And if you have no ceremony, no habits, which may be opulent or may be simple but are exact and rigorous and familiar, how can you reach toward the actuality of faith, or even a moral life, except vaguely? The patterns of our lives reveal us. Our habits measure us. Our battles with our habits speak of dreams yet to become real. 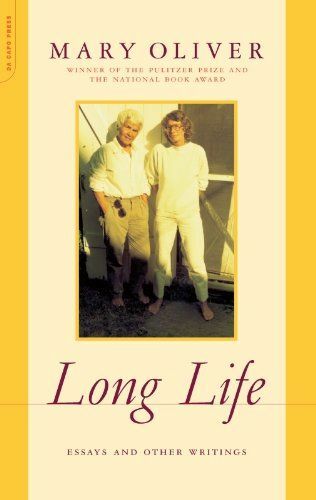 Complement Long Life, which is rich and alive in its entirety, with Oliver’s moving remembrance of her soul mate, her meditation on the mystery of the human psyche, and this gorgeous reading of her most enlivening poem.